The Toronto and Region Conservation Authority (TRCA), are reminding residents of dangers that exist near streams, rivers, ponds and lakes around this time of year and urge people to keep family and pets away from the edge of all waterways. 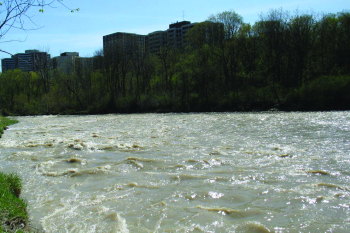 For our Emery Village residents please be reminded that the Humber River can become one of the most powerful forces of nature. Over the years, many have needed to rescued from the Humber’s torrent waters. With Spring here and with warmer temperatures, people look forward to getting outdoors. Warmer temperatures, generally also bring rain, melting snow and shifting ice which can contribute to higher, faster flowing water in watercourses. With warmer temperatures over the past few weeks, the snow packs have melted throughout the Greater Toronto Area. With the melted snowpacks and recent rainfall, the soil conditions within the TRCA watersheds remain saturated. The river and stream banks remain slippery and may be unstable and the extremely cold water temperatures can also lead to very hazardous conditions close to any body of water. As well, with intense rainfall that accompanies Spring conditions, the flows in TRCA watercourses will be faster and higher than usual. Please keep family members and pets safely away from any water’s edge and help make this an enjoyable Spring. For more information, contact the TRCA at: (416) 661-6514.